For a simple vegetarian family dinner that everyone will enjoy, you can’t go past this easy Pumpkin and Spinach Lasagna recipe! 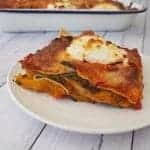 My Pumpkin and Spinach Lasagna recipe really is a great family meal and you will love how simple it is to put together. All you need to do is roast your pumpkin pieces (which you can do the day before if you like) and then layer them along with the rest of the ingredients and the Heinz Tomato and Pesto Lasagna Bake Sauce into your baking dish, add the cheese topping and bake in the oven for 35 minutes – how simple is that! We try to eat meat free a couple of times a week in our house and this Pumpkin and Spinach Lasagna has been a hit with all of the kids and my husband each time I have made it, the Heinz Tomato and Pesto Lasagna Bake Sauce helps to give this recipe a great flavour that goes just perfectly with the spinach and pumpkin and it’s not too over powering for the kids. I usually serve it either on it’s own for the little kids or with some homemade wedges and steamed veggies for the the rest of us and we are able to get two good meals out of one batch of this recipe. This recipe is also great to make on the weekend and then enjoy through the week for an easy weeknight meal and it is also freezer friendly too. What’s your favourite meat free family dinner? This easy Pumpkin and Spinach Lasagna recipe is family and freezer friendly and a great vegetarian meal option. Preheat your oven to 190 degrees celsius and lightly grease a 20cm square baking dish. Place the pumpkin pieces onto a baking tray and drizzle with the olive oil before sprinkling a little salt and pepper over the top. Pop into the oven and bake for 40 minutes or until the pumpkin is cooked through and beginning to brown on the outside. Transfer the pumpkin to a large bowl and mash with a fork. Set aside to cool slightly. Cover the base of your baking dish with lasagna sheets before adding half of the pumpkin mixture. Add a layer of spinach leaves (using half) before dolloping 1/3 of the Tomato and Pesto Lasagna Bake Sauce over the top. Add another layer of Lasagna sheets and repeat the above. Top with another layer of lasagna sheets and cover this with the remaining Tomato and Pesto Lasagna Bake Sauce. Dollop ricotta over the top and then sprinkle with mozzarella. Bake for 35 minutes or until the cheese sauce is golden. Allow the Pumpkin and Spinach Lasagna to stand for 5 minutes before serving. You can make this recipe up to three days in advance and reheat when needed.